Fire Projects recommend Notifier NFS-320 intelligent Fire Alarm Control Panel by Notifier for those who looking for reliable addressable fire alarm system. NFS-320 is part of the ONYX® Series of Fire Alarm Controls from NOTIFIER. In stand-alone or network configurations, ONYX Series products from Notifier meet virtually every application requirement. 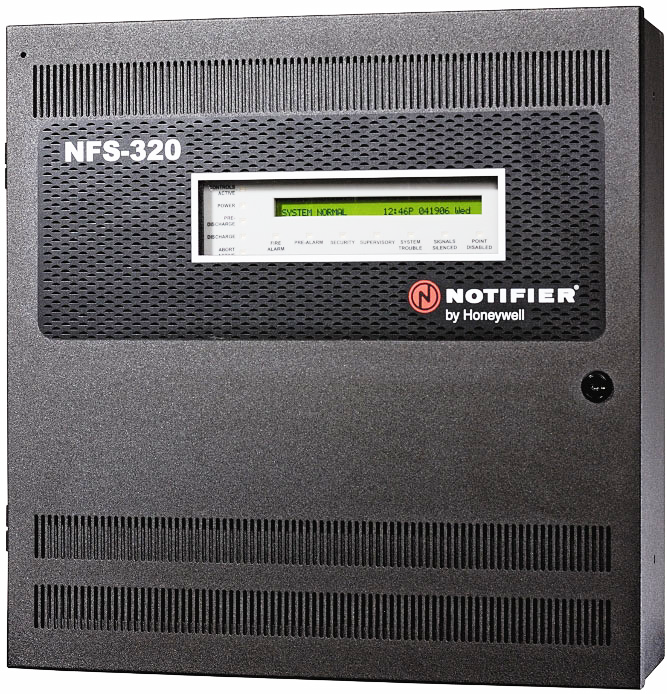 The Notifier NFS-320’s modular design makes system planning easier and that is reason it is first choice of Fire Projects (leading system integrator). The panel can be configured with just a few devices for small building applications, or networked with many devices to protect a large campus or a high-rise office block. Simply add additional peripheral equipment to suit the application. Wireless fire protection can be added with the SWIFT wireless gateway and devices. Notifier NFS-320 supply and installed by Fire Projects is smart and intelligent fire alarm panel which Polls up to 318 devices in less than two seconds, activates up to 159 outputs in less than five seconds and multi-colour LEDs blink device address during Walk Test. Selecting Fire Projects for new implementation of Notifier NFS-320 addressable fire alarm control panel is most effective fire alarm system for small to medium size organization, offices and building. We support our clients from Designing up to Commissioning up to AMC. We also provide AMC–Annual Maintenance Contracts for all types of Fire & security Systems. If you required new installation or AMC of fire alarm system, contact Fire Projects today! • Certified for seismic applications when used with the appropriate seismic mounting kit. • Approved for Marine applications when used with listed compatible equipment. See DN-60688. • One isolated intelligent Signaling Line Circuit (SLC) Style 4, 6 or 7. • Up to 159 detectors and 159 modules per SLC; 318 devices maximum. – Detectors can be any mix of ion, photo, thermal, or multisensor;wireless detectors are available for use with the FWSG. – Modules include addressable pull stations, normally open contact devices, two-wire smoke detectors, notification, or relay; wireless modules are available for use with the FWSG. • Optional FWSG Wireless SWIFT Gateway supports wireless SLC devices. – High-speed network for up to 200 nodes (NFS2-3030, NFS2-640, NFS-320(C), NFS-320SYS, NCA-2, DVC-EM, ONYXWorks, NFS-3030, NFS-640, and NCA). – Standard network for up to 103 nodes (NFS2-3030, NFS2- 640, NFS-320(C), NFS-320SYS, NCA-2, DVC-EM, ONYXWorks, NCS, NFS-3030, NFS-640, NCA, AFP-200, AFP- 300/400, AFP-1010, and AM2020). Up to 54 nodes when DVC-EM is used in network paging. • 6.0 A power supply with four Class A/B built-in Notification Appliance Circuits (NAC). Selectable System Sensor, Wheelock, or Gentex strobe synchronization. • Built-in Alarm, Trouble, Security, and Supervisory relays. • VeriFire® Tools online or offline programming utility. Upload/ Download, save, store, check, compare, and simulate panel databases. Upgrade panel firmware. • Autoprogramming and Walk Test reports. • 80-character remote annunciators (up to 32). • EIA-485 annunciators, including custom graphics. • History file with 800-event capacity in nonvolatile memory, plus separate 200-event alarm-only file. • Alarm Verification selection per point, with automatic counter. • Presignal/Positive Alarm Sequence (PAS). • Field-programmable on panel or on PC with VeriFire® Tools program check, compare, simulate. • Battery charger supports 18 – 200 AH batteries. • Non-alarm points for lower priority functions. • Remote ACK/Signal Silence/System Reset/Drill via monitor modules. • Automatic time control functions, with holiday exceptions. • Extensive, built-in transient protection. • Powerful Boolean logic equations. – NFS-320: 120 VAC, 50/60 Hz, 5.0 A. – NFS-320E: 220/240 VAC, 50/60 Hz, 2.5 A. – NFS-320(E) board: 0.250 A. Add 0.035 A for each NAC in use. – KDM-R2 (Backlight on): 0.100 A. • Total output 24 V power: 6.0 A in alarm. • Standard notification circuits (4): 1.5 A each. • Resettable regulated 24V power: 1.25 A. • Non-resettable 5V power: 0.15 A. • Battery charger range: 18 AH – 200 AH. Use separate cabinet for batteries over 26 AH. • Float rate: 27.6 V.
• Backbox: 18.12 in. (46.025 cm) width; 18.12 in. (46.025 cm) height; 5.81 in. (14.76 cm) depth. • Door: 18.187 in. (46.195 cm) width; 18.40 in. (46.736 cm) height; 0.75 in. (1.905 cm) depth. • Trim ring: Molding width is 0.905 in. (2.299 cm). • Shipping weight (without batteries): 36.15 lb. (16.4 kg).